Performance measurement is a process, not an event. It’s a series of specific activities for creating, implementing and using performance measures, and it’s not just a brainstorming session on the tail-end of your business planning workshop. If you don’t take each step in the process deliberately, there’s little wonder your performance measures or KPIs just aren’t measuring up. What most people are really searching for is the detailed, nitty-gritty, exactly-how-do-you-do-it steps of deciding what to measure, choosing the most appropriate measures, designing new measures from scratch, implementing measures, reporting measures in a useful and usable way, and integrating measures seamlessly into decision making. Selecting what to measure starts not with the question ‘what should we measure?’ but with first being clear about the results that matter most to you and your business. If you don’t know the performance results you’re trying to achieve, then you’ll probably too many measures that no-one finds useful, or no measures at all. And the way that most business strategy is written, it’s very hard to work out what the important results are, because of the vague language and broad terminology (for example: “We will enhance the quality, reliability, efficiency and effectiveness of our service delivery processes”). This first step in PuMP has you doing two things specifically: we first use the PuMP Results Mapping technique to decide what results are worth measuring, and then we use the PuMP Measure Design technique to create or select the measures that are the strongest and most feasible evidence of those results. No guessing, no brainstorming. The process of collecting data for performance measures is critical to its integrity and can be very resource intensive. The more you can limit your data collection to what is useful, not just interesting, the better off you’ll be. So it pays (literally) to be super-specific about the data you really need for your performance measures, and not just go create a survey or form to collect a bunch of data that seems potentially useful. There are two PuMP techniques that help maximise the benefits from your data collection efforts: the PuMP Measure Definition technique to be very precise about exactly what data each measure will need, and the PuMP Data Collection Process technique to design the steps to get the data you need without wasted time or effort. Where and how you store your data directly determines what data you can access, when and how quickly you can access it, how easy or difficult it is to access and how much cross-functional use you can get out it. Most of the skill for managing performance data lies in your organiation’s IT department, but your PuMP Measure Definitions will go a very long way toward helping the IT department get you access to the data you need, with the least effort. Analysis is the process of turning raw data into information. To make sure your performance measures are the most appropriate information you need to be almost pedantic about the analysis method you choose to answer those measures’ driving questions. 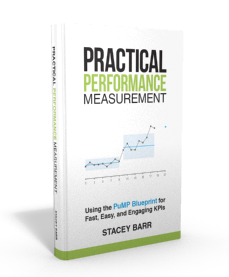 Again, the PuMP Measure Definition technique helps you make it very clear what the right analysis method is for each of your performance measures, and as such, these Measure Defintions become the blueprint or specification for exactly how each performance measure will be brought to life. No more pie charts or percentages when the real driving questions actually need a time series analysis! In communicating performance information, you are influencing which messages the audience focuses on. It’s vital to take care to present performance measures in ways that provide simple, relevant, trustworthy and visual answers to their priority questions. Too many people just throw performance reports or dashboards together with graphs designed to entertain rather than inform. And usually then end up misinforming! The PuMP Reporting Measures technique helps you to design a structure, content, layout and visual design for your performance reports that syncs with decision-making and helps the real performance signals jump right off the page. Interpreting your performance measures means translating messages highlighted by performance information into conclusions about what’s really going on. To turn information into implication, you must discern which messages are real messages (and not all of them are!). If you’re in the habit of comparing this month to last month, or this month to a target, you’re probably drawing the wrong conclusions from your measures! It’s the patterns, not the points, that we need to focus on with performance measures. And the PuMP Using Measures technique shows you which patterns to look for, what they mean, and how to respond to them so you don’t react to difference that aren’t real, and so you don’t miss the differences that are real. When you have worked out what is really going on with your organisation’s performance, you are ready to make some decisions about what to improve, how much to improve it by and how to do that improving. And you want to steer clear of the typical traps people fall into when they are deciding how to respond to their performance measures. The PuMP Using Measures technique helps you steer clear of traps like jumping to quick fixes that will fail, blaming results on things outside your control, and focusing too much on people rather than process improvement. Where is your performance measurement process strong, and where is it weak? Flowchart the steps you take to select, collect, store, analyse, present, interpret and apply performance measures to find where you could get the biggest improvement in your measures for the least effort. Try this complimentary PuMP Diagnostic Discussion Tool to trigger a very insightful discussion with your colleagues.